Venice has gained so many surnames that skeptics might find it incredible for a city to actually live up to the image depicted by them. In truth, Venice is resourceful enough to rightfully be dubbed the City of Masks, the Bride of the Sea, the Most Serene One and the Queen of the Adriatic. Tourists who choose to visit Venice will surely have the chance of checking the validity of these surnames and they are very likely to approve them. It can be stated Venice has set an example of urban planning, which is why other cities are referred to as the Venice of the North (Amsterdam) and the Miniature Venice (Grado). Bursting with historical heritage, Venice floats both in water and in unmatchable architectural display. Birthplace of Vivaldi, of Casanova and of Marco Polo, Venice rightfully enjoys the reputation of one of the top destinations in the world. Despite its scarcely documented origins, Venice has a rich history pegged out by moments of glory and intervals of gloomy defeat. However, either in its heydays or in overthrow, the city, now capital of the region of Veneto, has always been a power to be taken into consideration by all the other forces which used to carve the face of Europe in the past. Byzantium has always been the main constant ally of Venice. The heydays of Venice were when the city became a republic (roughly, between the late 7th century to late 18th century), when the city was a considerable naval power under the rule of the doges (dukes) of Venice. As from the 15th century, however, Venice started to lose its power by involving in utopian expansion projects. All in all, the ebullient history of Venice is nowadays imprinted in the overwhelming abundance of the historical heritage. 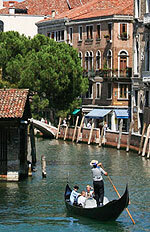 Venice is a popular destination and, like most destinations of such reputation, it gives rise to some of the most contradictory attitudes. Some of the less favorable comments concern the accommodation. Venice is reputed for its high prices, a policy practiced even by the lowest rated sleeping venues. In addition, prices do tend to increase during the tourist season or when worldwide renowned events are held in Venice (such as the Venice Carnival). Budget travelers should not expect the best of what accommodation generally means. However, those traveling on a generous budget are highly unlikely to find reasons to complain. Furthermore, even in such circumstances, making reservations in a timely manner still remains the best of all alternatives. The Veneto region has one of the most refined cuisines in Italy, which is a further reason for visiting Venice. Venice, as capital of the region, understandably displays all the peaks of the regional cuisine. The Venetian liver (fegato alla veneziana) is one of the classiest dishes in Venice, but one can also sample the so-called moeche (a crab specialty), risotto de go, or even cuttlefish in ink. In terms of desserts, baicoli is extremely popular in Venice, but the famed tiramisu should definitely not be overlooked, since it is the pride of the Veneto confectionery. Prosecco and Pinot Grigio are the most reputed wines in the region. Venice is divided into 6 districts, namely Cannaregio, San Polo, Dorsoduro, Santa Croce, San Marco and Castello, which are home to an impressive amount of attractions. There are some 50 museums and galleries in Venice, but the Doge's Palace, the Correr Museum, the Naval History Museum, the National Museum of Archeology, the Natural History Museum, the Ca’Pesaro International Gallery of Modern Art, the Academy Galleries and the Peggy Guggenheim Collection are definitely worth visiting. As far as the religious edifices are concerned, there are more than 100 places of worship in Venice. Of these, the Saint Mark's Basilica (and the adjoining Saint Mark's Campanile), the Church Santa Maria di Nazareth, the Basilica of Santa Maria della Salute, the Church of Santa Maria dell’Orto, the Church of San Zaccaria and the Church of San Giorgio Maggiore should not be overlooked. Furthermore, Venice is literally replete with historical landmarks. Of these, one should always want to visit the plethora of palaces, such as Palazzo Contarini del Bovolo, Palazzo Grassi, Palazzo Labia and Ca'Vendramin Calergi (home to the Wagner Museum and to Casino di Venezia), without overlooking landmarks like Scuola Grande di San Marco, the Bridge of Sighs, Oratorio dei Crociferi and the Rialto Bridge. The Venice Carnival is so famous that it has become a symbol of the city. Besides the Carnival, other cultural and artistic events refer to the reputed Venice Biennale, the Venice Biennale of Architecture, Restaura, Viaggiandum Est, the Venice Film Festival, Premio Venezia, just to cite a few examples. As far as the popular sports events are concerned, Vogalonga, Raid Pavia Venezia, the Murano Regatta, the Pellestrina Regatta and the Burano Regatta are the most awaited. The so-called Festa della Sensa, Mare Maggio, the New Year's Eve, the Witches Regatta, Su e Zo per i Ponti, Festa del Bocolo, the San Pellegrino Cooking Cup, the Venice International Boat Show, Festa del Redentore, the Historical Regatta and the Regatta of the Ancient Maritime Republics are just as popular.